And now for the third asparagus recipe: Asparagus with Vinaigrette. In the introduction to the asparagus recipe, the authors say “Melted butter is possibly the first choice for hot asparagus, vinaigrette with cold.” So, I guess I ought to serve this asparagus cold. I’d planned on some fried chicken for the evening meal, and figured I’d serve that with some salad. Asparagus would make a nice addition, so asparagus with vinaigrette it was. 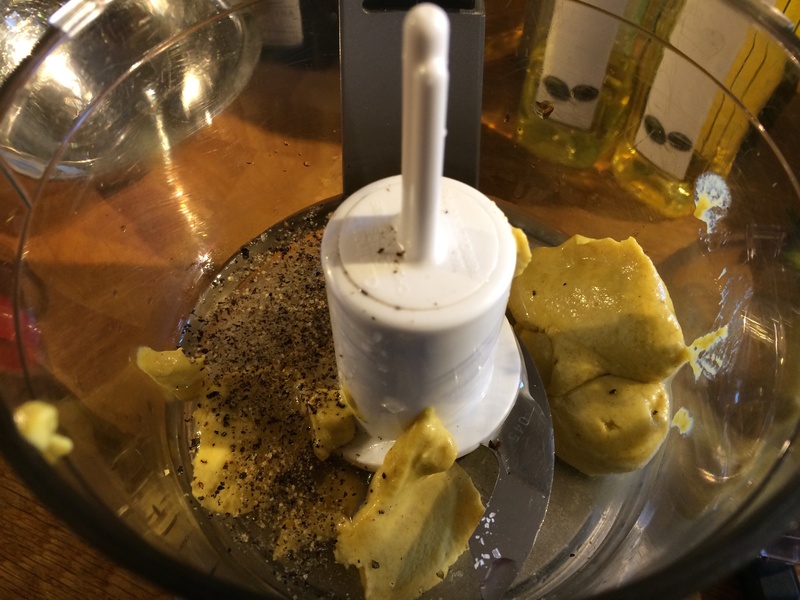 The vinaigrette was very easy to make – it’s just an emulsion of oil and water, with some flavourings. 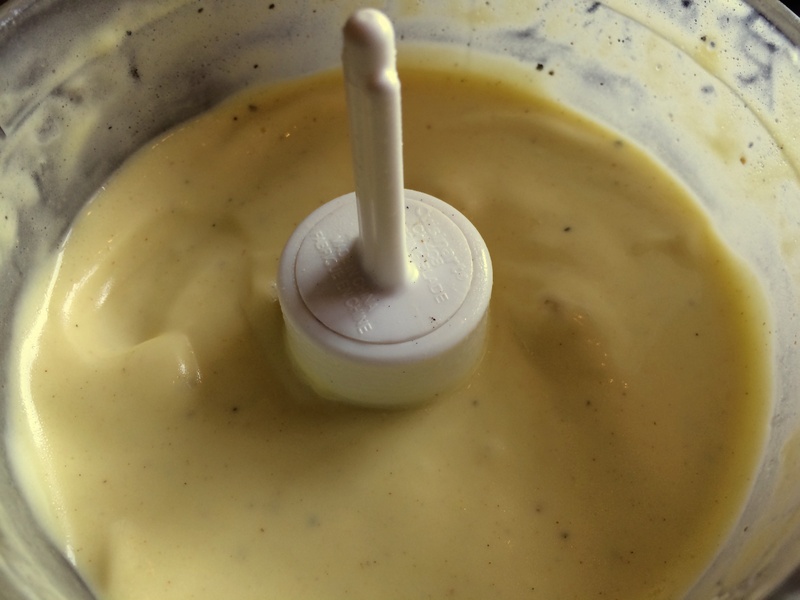 So, sugar, salt, pepper, vinegar and mustard were added to my food processor, with a little water, and then oil drizzled in, just as you would when making mayonnaise. The end result was a creamy, and very tasty dressing. Once again, the vinaigrette was a superb accompaniment to the not quite cold, but decidedly tepid asparagus that I served it with. The recipe made a huge amount of vinaigrette, and so there was plenty left over which I was sure would go very nicely with salads later in the week, but, rather sadly, I dropped the bowl as I was transporting it to fridge for safekeeping. Apparently, a ceramic bowl full of left-over vinaigrette makes quite a mess when it hits a tiled kitchen floor. This was like really nice salad cream! I was surprised that the asparagus was cold, but it got used to that. It’s better hot though in my opinion. I loved the dressing. It went so well on the salad. 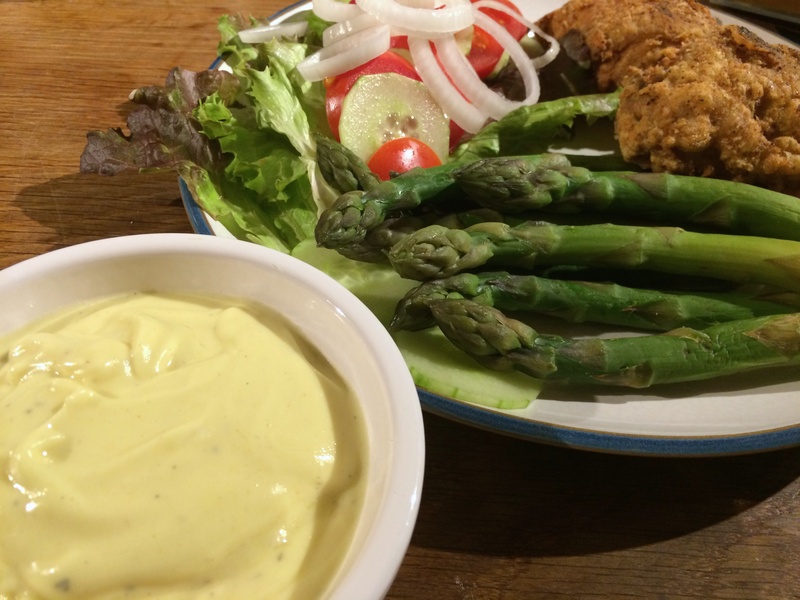 I still think my favourite asparagus dip was the lemon butter, but the vinaigrette is great for salad dressing.